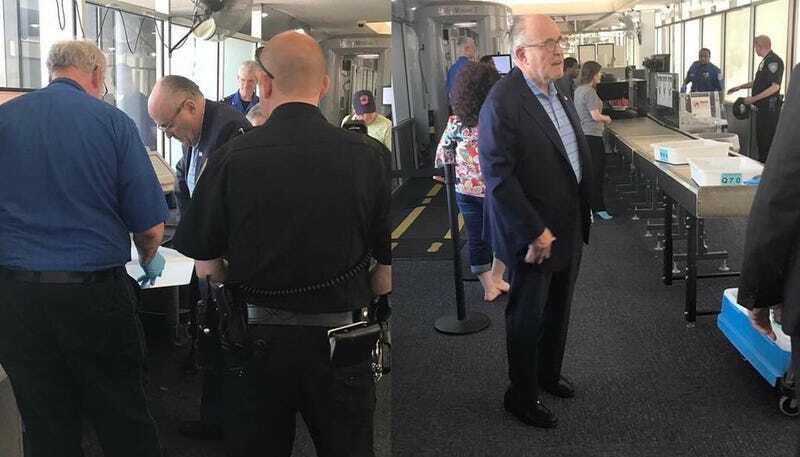 Yesterday morning, Rudy Giuliani—America’s mayor, Donald Trump’s current cybersecurity advisor, and a race-baiting thug most famous for being circumstantially tied to a great tragedy—had a little dust-up with the TSA while making his way through Newark airport. Apparently, the former mayor who famously saw his city devastated by men who’d smuggled cutting implements onto aircrafts tried to smuggle a cutting implement onto an aircraft. Rudy—have you forgotten? According to our tipster, at around 10 a.m. on May 19, Giuliani had his bags “torn apart for having two cigar cutters and a lighter on him.” TSA regulations explicitly prohibit cigar cutters in carry on luggage, something we would hope that the mayor who oversaw our country’s recovery after 9/11 would be aware of. As far as we know, once the proscribed items had been seized, our former Cigar Aficionado cover boy was free to go on his way. But thanks to the hardworking men and women of the TSA, at this point, Rudy’s plans were thwarted and the skies safe once more. We’ve reached out to Giuliani for comment, and will update if and when we hear back. In the meantime, if you have any more information on flagrant attempted violations of airspace security by our country’s leaders, please do let us know.